From the *Department of Family and Community Medicine and the †Centre for Research in Women's Health, Sunnybrook & Women's College Health Sciences Centre, University of Toronto, Toronto, Ont. Background: Abuse during pregnancy is considered to be a potentially modifiable risk factor for low birth weight (LBW). We conducted a systematic review and meta-analysis to determine the strength of association between physical, sexual or emotional abuse during pregnancy and LBW. Methods: We selected papers for review from an electronic search of MEDLINE (1966–1999), CINAHL (1982–1997) and the Cochrane Library. We retrieved articles using the following MeSH headings and keywords: “infant low birth weight,” “fetus,” “perinatal care,” “pregnancy,” “prenatal care,” “infant mortality,” “violence,” “battered women,” “spouse abuse,” “infant morbidity,” “antenatal” and “neonatal.” When necessary, we contacted authors to obtain data that were not included in the published material. We analyzed the methodological quality of each eligible study and selected those of the highest quality for meta-analysis. Results: We reviewed 14 studies, of which 8 were selected for meta-analysis. Using a fixed-effects model, we found that women who reported physical, sexual or emotional abuse during pregnancy were more likely than nonabused women to give birth to a baby with LBW (odds ratio 1.4, 95% confidence interval 1.1–1.8). Interpretation: Abuse may be part of a complex interaction of factors that contribute to LBW. We selected papers for review from an electronic search of MEDLINE (1966–1999), CINAHL (1982–1997) and the Cochrane Library. We retrieved articles using the following MeSH headings and keywords: “infant low birth weight,” “fetus,” “perinatal care,” “pregnancy,” “prenatal care,” “infant mortality,” “violence,” “battered women,” “spouse abuse,” “infant morbidity,” “antenatal” and “neonatal.” We cross-checked references to articles. Abstracts from the Congress of the International Federation of Gynecologists and Obstetricians were examined. We did not attempt to locate unpublished studies. We contacted authors of selected studies to obtain data that were not included in the published material. We selected studies if they met the following eligibility criteria: they were case–control or cohort studies published as a paper or abstract in English, and they focused on women abused during pregnancy or pregnant women living in a relationship that was abusive in the past, or both. Studies were chosen regardless of the relationship of the perpetrator to the victim, if they included clear definitions of physical, sexual or emotional abuse, or some combination of these, and examined the outcome of mean birth weight or LBW. A meta-analysis was performed using a fixed-effects model. We calculated odds ratios for each study and combined them across studies, giving weight according to the inverse of variance in each separate study. The Mantel–Haenszel 𝛘2 statistic was used to combine the odds ratios. The Breslow–Day 𝛘2 statistic was calculated to test for possible heterogeneity among the calculated odds ratios. A total of 537 articles were retrieved. The majority of the papers were excluded on the basis of being noncontributory, such as clinical guidelines, antenatal health policy or prevalence studies that did not measure pregnancy outcomes. One study identified by an English abstract was written in Spanish and was translated for this review.9 Fourteen studies met the eligibility criteria for the systematic review. Two of us (C.M. and B.S.) independently assessed all the papers. Interrater reliability was moderate (intraclass correlation coefficient = 0.58).10 The scores awarded by each author were then averaged for each study. These final scores clustered in 2 groups, fulfilling 55%–70% or 75%–90% of Bracken's criteria. We selected all studies that had a combined quality score of 75% or more for our meta-analysis. The characteristics of the studies selected for meta-analysis are outlined in Table 1. The research was conducted in the United States, Australia and Norway.11,12,13,14,15,16,17,18 Two case–control studies were included,16,18 in which women who delivered an infant with LBW were compared with women who delivered infants of normal birth weight. In the Norwegian study,16 participants (86 cases, 92 controls) were recruited consecutively from the University Hospital of Trondheim, which serves a geographically defined population, and thus represents the only study based on a population sample. The study by Campbell and colleagues18 differed from the others in that separate analyses were conducted for infants over 38 weeks' gestation (63 cases, 189 controls) and under 38 weeks' gestation (238 cases, 88 controls). Sample sizes ranged from 178 to 1897 women.11,12,13,14,15,16,17,18 Amaro and colleagues,11 Berenson and colleagues,12 McFarlane and colleagues,14 and Curry and colleagues17 performed cohort studies of predominantly low-income and minority women. The study by Dye and colleagues13 was unique in that it was the only selected study conducted in a rural setting. Finally, Webster and colleagues15 studied a large cohort of Australian prenatal patients. The time and frequency of inquiries about abuse varied across the studies. Most studies interviewed women during the prenatal period.11,12,13,14,15,17 Four studies reported conducting only one interview during the prenatal period.12,13,15,17 McFarlane and colleagues14 interviewed women 3 times during the prenatal period. Amaro and colleagues11 interviewed once prenatally and once in the postpartum period. Campbell and colleagues18 interviewed once within 72 hours of delivery, and Grimstad and colleagues16 interviewed women during the postpartum period or 1 year after delivery. For the meta-analysis, data were extrapolated from each study to assess the impact of abuse that occurred during the current pregnancy. This was not possible for the Norwegian study.16 For this study, the data included in the meta-analysis were based on women abused in the current pregnancy or the current relationship, or both. The definition of the outcome of LBW is a standard measurement of morbidity accepted as birth weight of less than 2500 g.1 Two studies12,17 defined LBW as less than or equal to 2500 g. The cause of LBW may stem from prematurity or poor intrauterine growth. In most studies, however, the mechanisms for LBW were not addressed separately. The research findings are summarized in Table 2. In studies that only provided the percentages of LBW infants,13,14 raw data were extrapolated using the totals in each exposure group. We contacted 3 authors11,15,17 to obtain the number of LBW infants in the exposure groups. Three cohort studies13,14,15 found statistically significant associations between abuse and mean birth weight. In the studies by McFarlane and colleagues14 and Webster and colleagues,15 the unadjusted mean birth weight was significantly lower for babies of abused women (133 g lower and 132 g lower respectively). On adjustment for differences in age, smoking, alcohol, education, ethnic origin, marital status, parity, number of terminations, antenatal visits and gestational age, Webster and colleagues15 found that the relation between mean birth weight and current abuse was no longer statistically significant. The association between abuse and mean birth weight (164 g lower, p < 0.05) uncovered by Dye and colleagues13 was not adjusted for confounders. In a multiple regression analysis, controlling for biomedical risk, age, ethnic origin, smoking, and marijuana and other drug use, Curry and colleagues17 found a statistically significant abuse and smoking interaction and an abuse and marijuana interaction associated with birth weight. For women who reported abuse, smoking and the use of marijuana increased the risk of delivering an infant with a lower birth weight. A standard test for heterogeneity found that the pooled data were homogeneous and appropriate to test our general hypothesis that women who reported physical, sexual or emotional abuse during pregnancy were more likely than nonabused women to give birth to a baby with LBW. When the 8 studies were entered into the meta-analysis, an odds ratio of 1.4 was found (95% CI 1.1–1.8) (Fig. 1). To further examine our findings, we performed a sensitivity analysis. Removing the 2 case–control studies from the meta-analysis reduced the odds ratio to 1.3 (95% CI 1.0–1.8). Fig. 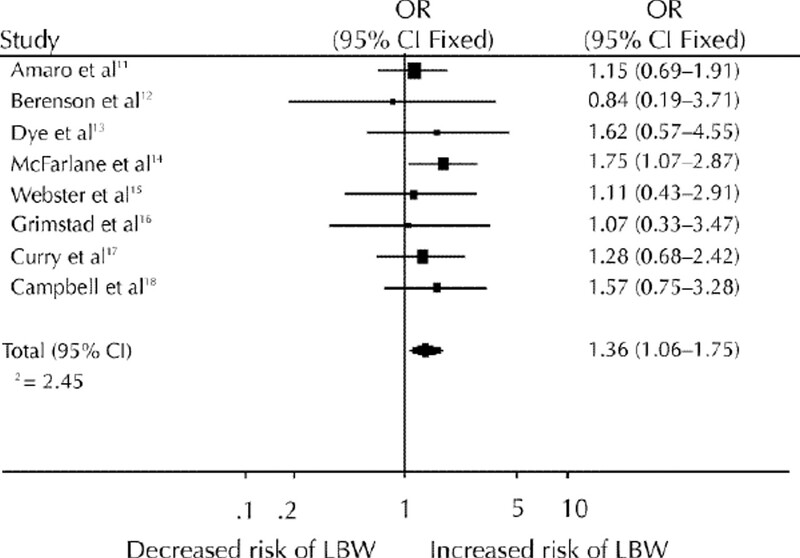 1: Odds ratios for an association between abuse during pregnancy and low birth weight (LBW). CI = confidence interval. In our meta-analysis, we found a significant association between abuse and LBW. These findings are similar to those of the systematic review21 by Peterson and colleagues of 7 research papers on violence and adverse outcomes of pregnancy. They found that only 2 pregnancy outcomes, mean birth weight and the incidence of LBW, appeared in more than one study to be statistically associated with abuse during pregnancy. However, their review differed from ours in several ways. The authors did not perform a meta-analysis, nor were the studies assessed according to methodological quality. Finally, some of the papers included in their review were different from those included in our review. We acknowledge certain limitations of this meta-analysis. The variation in the definition of exposure and outcome used in each of the studies considered here may have altered the association between abuse and LBW. Individual patient interpretation of abuse may vary, making it harder to determine a reliable association. Reporting bias could also have led to the misclassification of abused women into a nonabused exposure group. Although 2 of us (C.M. and B.S.) conducted the assessment of study quality using a standard method, it was not done in a blinded fashion. Furthermore, the second author had been involved in 2 of the studies, and one of these was included in the meta-analysis. Finally, the number of studies available for review that were subsequently included in the meta-analysis was small. The study populations were predominately of lower socioeconomic status. The combination of data from more studies, with varied populations of women, would enhance generalizability and statistical power, thereby allowing for a more complete assessment of the impact of abuse on LBW. Further research is needed on the influence of social factors on physiology and pregnancy outcomes29 and the mechanisms through which abuse may affect birth weight. Several authors2,30 have made recommendations to improve the investigation of violence and pregnancy. These include better methods to compare the frequency and severity of violence both during pregnancy and not during pregnancy, methods to study the context in which the violence occurs, and clarification of the role of risk factors in the association of violence and LBW. The US Centers for Disease Control and Prevention aim to standardize measures of abuse.31 When these methodological improvements occur, a more definitive conclusion on the relation of abuse to LBW will be possible. In the meantime, we need to strengthen the trend toward the assessment of psychosocial issues during pregnancy as a standard of care. The Society of Obstetricians and Gynaecologists of Canada recommends prenatal screening and the identification of women who are victims of abuse.32 Other Canadian initiatives include the Antenatal Psychosocial Health Assessment (ALPHA) form, which can be used as a guide for health care providers to assess risk factors, such as abuse, that are associated with poor postpartum outcomes.33 Questions about abuse could also be entered into databases such as the Canadian Perinatal Surveillance System.34 A high index of suspicion among prenatal care providers is needed. The identification of violence during antenatal care may help identify women at risk of delivering a baby with LBW. Future research should address whether intervention strategies improve perinatal outcomes in women who experience abuse during pregnancy. We thank Drs. Nick Pimlott, Stephen Holzaphel and Rick Glazier for their insightful comments on an earlier draft of this paper. We acknowledge the Atkinson Foundation for funding the Atkinson Chair in Women's Health Research, held by Dr. Berit Schei at the Centre for Research in Women's Health, a partnership of the Sunnybrook & Women's College Health Sciences Centre and the University of Toronto, Toronto, Ont. Contributors: Dr. Murphy made a substantial contribution to the design and execution of the study and the data analysis. She also wrote the first draft of the paper. Dr. Schei made a substantial contribution to the design and execution of the study and assisted in extracting the data and in revising the paper. Ms. Myhr extracted and analyzed the data and made a substantial contribution to the revisions of the paper. Dr. Du Mont made a substantial contribution to the design and execution of the study and assisted in revising the manuscript. The Perinatal Education Program of Eastern Ontario. Prevention of low birth weight in Canada: literature review and strategies. 2nd ed. 1998. Available: www.beststart.org/lbw/lbw98TOC.html (accessed 2001 April 17). Gazmararian JA, Lazorick S, Spitz AM, Ballard T, Saltzman L, Marks JS. Prevalence of violence against pregnant women. JAMA 1996;275(24):1915-20. Stewart D, Cecutti A. Physical abuse in pregnancy. CMAJ 1993;149(9):1257-63. Curry MA, Harvey SM. Stress related to domestic violence during pregnancy and infant birth weight. In: Campbell JC, editor. Empowering survivors of abuse. Thousand Oaks (Calif): Sage Publications; 1998. p. 98-108. Bracken MB. Reporting observational studies. Br J Obstet Gynaecol 1989; 96:383-8. Thacker SB, Peterson HB, Stroup DF. Metaanalysis for the obstetrician-gynecologist. Am J Obstet Gynecol 1996;174:1403-7. Greenhalgh T. How to read a paper: papers that summarize other papers (systematic review and meta-analysis). BMJ 1997;315:672-5. Valdez-Santiago R, Sanin-Aguirre LH. La violencia domestica al ambarazo y su relacion con el peso al nacer. Salud Publica Mex 1996;38:352-62. Shrout PE, Fleiss JL. Intraclass correlations: uses in assessing rater reliability. Psychol Bull 1979;86(2):420-8. Amaro H, Fried L, Cabral H, Zuckerman B. Violence during pregnancy and substance use. Am J Public Health 1990;80:575-9. Berenson A, Wiemann M, Wilkinson G, Jones W, Anderson G. Perinatal morbidity associated with violence experienced by pregnant women. Am J Obstet Gynecol 1994;170(6):1760-9. Dye T, Tollivert N, Lee R, Kenney C. Violence, pregnancy and birth outcome in Appalachia. Paediatr Perinat Epidemiol 1995;9:35-47. McFarlane J, Parker B, Soeken K. Abuse during pregnancy: associations with maternal health and infant birth weight. Nurs Res 1996;45:37-42. Webster J, Chandler J, Battistutta D. Pregnancy outcomes and health care use: effects of abuse. Am J Obstet Gynecol 1996;174:760-7. Grimstad H, Schei B, Backe B, Jacobsen G. Physical abuse and low birthweight; a case-control study. Br J Obstet Gynaecol 1997;104:1281-7. Curry MA, Perrin N, Wall E. Effects of abuse on maternal complications and birth weight in adult and adolescent women. Obstet Gynecol 1998;92:530-4. Campbell J, Torres S, Ryan J, King C, Campbell DW, Stallings RY, et al. Physical and nonphysical partner abuse and other risk factors for low birth weight among full term and preterm babies: a multiethnic case control study. Am J Epidemiol 1999;150(7):714-26. McFarlane J, Parker B, Soeken K, Bullock, L. Assessing for abuse during pregnancy: severity and frequency of injuries and associated entry into prenatal care. JAMA 1992;267:3176-8. Straus MA. Measuring intrafamily conflict and violence: the conflict tactics scale. In: Straus MA, Gelles RJ, editors. Physical violence in American families: risk factors and adaptations to violence in 8,145 families. New Brunswick (NJ): Transaction Publishers; 1990. p. 29-47. Peterson R, Gazmararian JA, Spitz AM, Rowley DL, Goodwin MM, Saltzman LE, et al. Violence and adverse pregnancy outcomes: a review of the literature and directions for future research. Am J Prev Med 1997;13:366-73. Newberger E, Barkan S, Lieberman E, McCormick M, Yllo K, Gary L, et al. Abuse of pregnant women and adverse birth outcome: current knowledge and implications for practice. JAMA 1992;267:2370-3. Pearlman MD, Tintinalli JE, Lorenz RP. Blunt trauma during pregnancy. N Engl J Med 1990;323:1609-13. Ribe JK, Teggatz JR, Harvey CM. Blows to the maternal abdomen causing fetal demise: report of three cases and a review of the literature. J Forensic Sci 1993;38(5):1092-6. Campbell J, Poland M, Waller J, Ager J. Correlates of battering during pregnancy. Res Nurs Health 1992;15:219-26. Berenson A, Stiglich N, Wilkinson G, Anderson G. Drug abuse and other risk factors for physical abuse in pregnancy among white non-Hispanic, black and Hispanic women. Am J Obstet Gynecol 1991;164:1491-9. Martin SL, English KT, Clark K, Cilenti D, Kupper L. Violence and substance use among North Carolina pregnant women. Am J Public Health 1996;86:991-8. Stewart D. Incidence of postpartum abuse in women with a history of abuse during pregnancy. CMAJ 1994;151(11):1601-4. Kogan MD. Social causes of low birth weight. J R Soc Med 1995;88:611-5. Ballard TJ, Salzman LE, Gazmararian JA, Spitz AM, Lazorick S, Marks JS. Violence during pregnancy: measurement issues. Am J Public Health 1998; 88:274-6. Campbell J. Abuse during pregnancy: progress, policy and potential. Am J Public Health 1988;88(2):185-7. Society of Obstetricians and Gynaecologists of Canada. Policy statement: violence against women. J Soc Obstet Gynaecol Can 1996;18:803-7. Levitt C. Canadian perinatal surveillance system. Can Fam Physician 1998;44:583. Abuse during pregnancy: a quintessential threat to maternal and child health -- so when do we start to act?